Many moons ago a conversation took place in the hollowed grounds of Twitter. 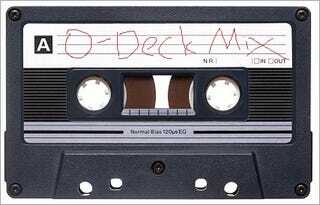 The discussion involved the lost art of the mixtape, and it was decided that the modern equivalent must surely be the playlist. Further conversation led to an idea, and it's this idea I present to you now. 1. The total length of the playlist cannot exceed 60 minutes. You don't have to do a full 60 minutes. Mixtapes are personal so the length is subjective. Quality over quantity. If you want to split your playlist into two 30 minute halves I'm not saying there will be bonus points, but I'm sure we'll all admire your spirit. 3. A link to the song must be included. This can be to a Youtube video, Spotify link, or whatever you like best. After all, one cannot judge a mixtape without hearing the music. I suggest having each track listed be the link for sake of tidiness, but you can share the links however you like. That should be it basically. I ask that any questions or comments be kept in a single comment "circle" (ugh) to keep things tidy. You all have 24 hours starting at noon today CST to submit, and the winner will be announced sometime tomorrow afternoon. Keep in mind that it's a judged event about music so results will be subjective by definition.